US birth certificate must be legalized by the Chinese Embassy or Chinese consulate in order to be used in China. This process is called authentication. China is not a member of Hague Convention, therefore Apostille is not acceptable. The birth certificate should be first be authenticated by the secretary of state office, then further authenticated by the Chinese Embassy or Chinese Consulate accordingly. Contact with your state vital record office to obtain a certified birth certificate. The certified birth certificate should look and feel like the original. Contact with your secretary of state authentication office for authentication. The secretary of state will add a cover statement with a designated big seal, signature and wording recognized by Chinese Consulate. Once authenticated, the staple(s) must not be removed or it will invalidate the document. When you submit the birth certificate to the secretary of your state, please indicate the document will be used in China. The birth certificate should be authenticated. 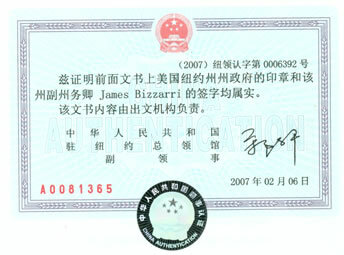 Apostille is not recognized in China. Birth certificate issued in DC jurisdiction must be further authenticated by the US Department of State. It's possible to combine step 1 and step 2 together, please check with your secretary of state office for detail. Original Consular Report of Birth Abroad can be authenticated by the Chinese Embassy directly, please follow step 3. Q: Can minor be applicant on the application form? A: If the birth certificate is for minor (under 18 years of age), one of parents should be the applicant and sign the application form. Q: What should I fill in "Supporting documents and Copies of Legalization" section? A: It simply means how many set of documents you need for authentication. If you only have 1 document, simply type in "1 ORIGINAL AND 1 PHOTOCOPY". You will need to pay for each document that needs authentication. Photocopy of applicant's passport. If the birth certificate is for minor, photocopy of minor's passport together with photocopy of both parent's passport are required. Birth certificate issued in DC jurisdiction must be further authenticated by the US Department of State (Federal level) after authentication by your state's secretary office (state level). States under DC jurisdiction include Delaware, Idaho, Kentucky, Maryland, Montana, Nebraska, North Carolina, North Dakota, South Carolina, South Dakota, Tennessee, Utah, Virginia, West Virginia, Wyoming and Washington DC. Copy of the passport or photo ID of the applicant. In cases of commercial authentication, a copy of the company's license or proof of good standing of the company are required. Check or money order payable to VisaRite Service to cover the total cost.